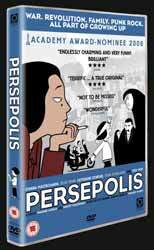 Persepolis is the autobiographical tale of Marjane Satrapi and is based on her four graphic novels covering her escape to an education in Vienna and then a bittersweet return to her native country. It deals with the impact of the Iranian Islamic revolution on this young girl's life as she grows to adulthood. This animated movie is mainly in black and white, switching to colour for the sections based in the present, and charts Satrapi's life. It opens in 1979 with her at age 10, living in Persepolis, Iran. Like any young girl, she adores her family and has dreams for her future. Her father tells her the recent history of her country and how Britain got involved with Iran in it's bid to take control of the country's oil in return for allowing the Shah to become more powerful. Now, his son has taken over and is an even worse ruler. The general uprising against the Shah of Iran doesn't go as planned, when Islamic Fundamentalists are pushed into power following the elections, and push Iranian society into a more repressive state that sees the arresting and execution of thousands - including Satrapi's uncle, who she is very close to. As Satrapi grows older her family soon realise that she is danger of being arrested herself - she secretly buys western music, wears western clothes and speaks her mind against a teacher who denies that the government abuses its powers. They send her to study in Vienna, Austria where she forms friendships with individuals that take their freedom for granted. She also falls in love with a boy who, after sleeping with her, realises he's gay and another young man who she finds cheating on her. Satrapi returns to Persepolis to find that the living conditions are even worse than when she was last there thanks to acts including mass executions for holding the wrong political beliefs. As things get progressively worse Satrapi once again prepares to leave her beloved parents and grandmother behind and move to France... for good. Extras are pretty impressive. We get Raging Blues Short Film by Vincent Paronnaud (6 min, 04 sec); Joe Sacco Interview (11 min, 49 sec chat with the journalist and artist); Gena Rowlands Interview (11 min, 49 sec chat with the voice of Satrapi's grandmother in the English language dub); Vincent Paronnaud Interview (35 min, 53 sec chat with the co-director); Brian K Vaughan Interview (20 min, 03 sec chat with the comic book writer famous for his work on comic books Y: The Last Man and Ex Machina, as well as being one of the main writers for the TV series Lost's third season); Making of La Face Cachée de Persepolis (The Hidden Side of Persepolis) (30 min, 12 sec behind the scenes featurette. Highlights include the scene from the film that has both directors standing together, a look around the animation studio, and seeing the sound effects being recorded - interesting to see that the noise of the tanks was made by a large chain being moved on the floor while a rusty door hinge was moved); and Trailer (2 min, 04 sec). Audio options are English or French (with optional subtitles) in 2.0 or 5.1 mixes. This movie is a moving experience that will give viewers a glimpse of what it must have been like growing up in a land where freedom of speech is not a right and then coming to the west and seeing people take for granted their freedom.